Do you want to add a splash of colour in your home, but aren’t sure where it should go? If you’re looking for some inspiration, there is certainly no going past the bathroom – where using various hues to complement predictable neutrals can create an unexpected, sophisticated result. Adding bold and balanced colours to your bathroom can be a real winner. And one of the best ways to do so is through our beautiful gemstone tops! 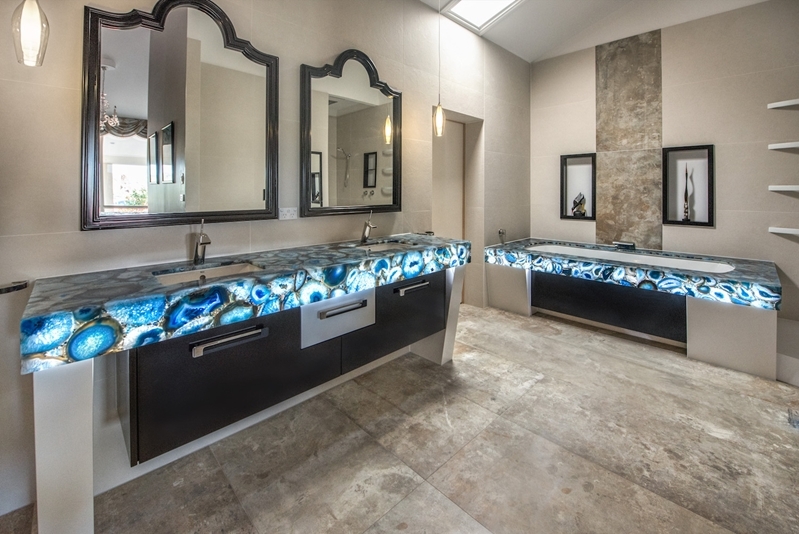 We at Bubbles Bathrooms recently finished a project that showcases gemstone tops perfectly. Check out the details below and why you should enquire about this option for your bathroom. Designed by Owen and Zacharia, this master bedroom ensuite took inspiration from the client’s favourite stone, Lapis Lazuli – a stunning, deep blue stone. To achieve this stunning effect, our team decided to use Caesarstone Blue Agate which is described as “reminiscent of deep ocean blues and low tide turquoise”. Gemstone tops become the focal point of the bathroom. Caesarstone Blue Agate with white composite stone buttresses was used in two locations. Firstly, as gemstone top around the sinks and also as a bath hob which was custom-made with broad edges for optimum comfort. Thanks to the splash of colour, the space stimulates the senses while being both bold and luxurious. Gemstone tops are timeless, robust and functional – allowing you to discover new details every day. Match bath hobs and tops with gemstone designs. This bathroom on Edwin Road was the winner of HIA Victoria’s ‘Best Bathroom Design and Best Bathroom Renovation over $50K’ in 2016. The Edwin Road bathroom is a great example of where bold gemstone design and colour work brilliantly. So, if you are interested in replicating this style in your own space, what are the things you need to know about gemstone tops? Here are four key points. As a focal point, they can set the atmosphere of a bathroom and offer that special luxurious feel that you get with high-end spaces. 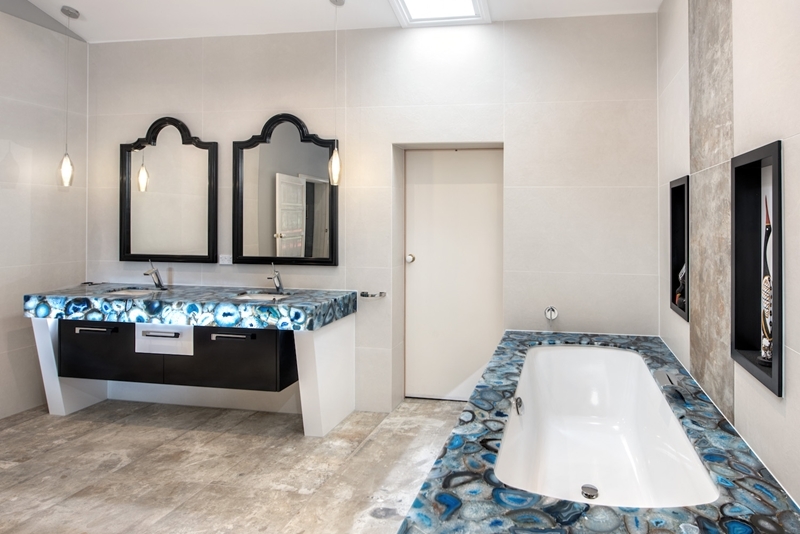 The expert team at Bubbles Bathrooms are happy to talk through any aesthetic ideas and requirements you may have in relation to gemstone tops. For more information, reach out to us today.